A man closes a water meter in Philcoa, Quezon City yesterday. The Manila Water Company Inc. said yesterday it is studying the Metropolitan Waterworks and Sewerage System’s call for the firm not to charge customers following the weeklong supply interruptions its customers suffered. 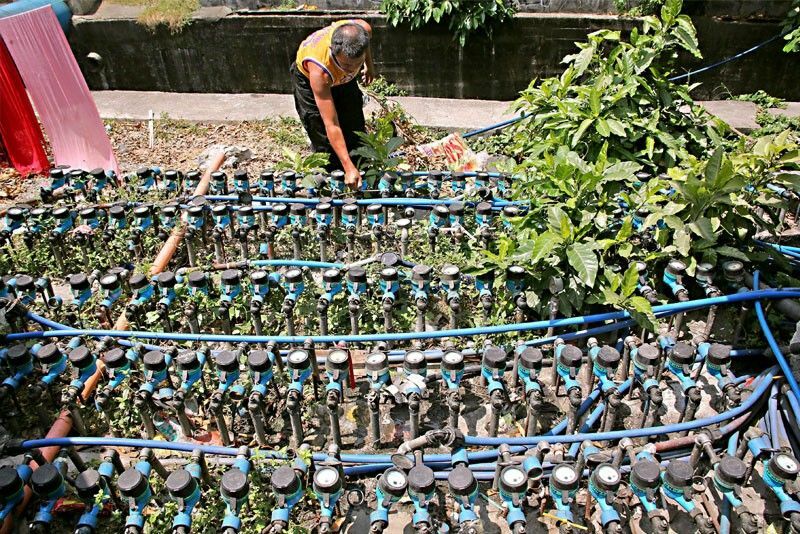 MANILA, Philippines — The Metropolitan Waterworks and Sewerage System (MWSS) yesterday urged east zone concessionaire Manila Water Co. Inc. to suspend bill collection to help ease the burden of its millions of customers suffering from water shortage. “If they can afford to waive fees for the entire month then that would be good,” MWSS chief regulator Patrick Ty said. He said this is among several measures the MWSS is adopting to ease the burden of Manila Water’s 6.8 million customers in the east zone covering Metro Manila and nearby Rizal province. “We will discuss this in a meeting with Manila Water officials on Monday. Suspension of collection payment should be made while there is no water, or the service is interrupted. They should not send the bill or not even disconnect anyone not paying,” he said. Ayala-led Manila Water yesterday announced it has restored the water supply in almost all of its concession area in Metro Manila and Rizal, almost two weeks after continuous interruptions. The company said water from the tap is now available to 96 percent of its customer base compared to 80 percent last week, with supply available from eight to 12 hours, at least at the ground floor level of residences. Manila Water said the rotational water supply scheme that began on March 14 had allowed the 28 reservoirs to recover and refill. The scheme was adopted as a temporary measure to balance water supply distribution. In the past days, Manila Water has been making calibrations in its network distribution that has resulted in the continuous improvement of water restoration. “This was complemented with various technical and network improvements such as fine-tuning of valving activities, installation of line boosters and laying of reinforcing lines particularly for areas located at the high elevation and those far from the source,” Manila Water said. For areas where water availability is still below eight hours, Manila Water continues to provide water tanker support. These areas include Raja Sumakwel of Upper Bicutan in Taguig, Kawilihan in Bagong Ilog in Pasig, Hulo in Mandaluyong, portions of Kasiglahan Village in San Jose and San Isidro in Rodriguez, Rizal, portions of Quezon City, Guitnangbayan in San Mateo and Sitio Halang in Binangonan. Additional supply coming from various sources has augmented supply as a number of deep wells have also begun operations while 24 million liters per day are produced from the recently commissioned Cardona Water Treatment Plant. Manila Water has interrupted supply two weeks now in most of its concession area as water level in La Mesa Dam dropped to critical levels amid El Niño and continuous demand. Supply from La Mesa is Manila Water’s reserves since it has maximized allocation from Angat Dam at 1,600 million liters per day. The improvement in water supply came after President Duterte warned he would terminate the contracts of the concessionaires Manila Water and Maynilad if water supply deteriorates. The MWSS said it has sent Manila Water a notice following its failure to provide 24-hour water service to customers. The MWSS said they needed at least 15 days counting from the time of Manila Water’s failure to provide service, for them to send the water company a notice to explain. Ty said this is where the rebate could come in. It could be implemented by June or July. He explained a rebate is an option is in the concession agreement. He said a rebate would not depend on March consumption, but will be computed as 25 percent of the cost incurred by the concessionaire to bring back 24-hour water delivery. “First we need to follow due process. If they don’t comply and fail to submit an explanation, then that is the time, we will send them a notice of violation of the concession agreement,” Ty said. Ty said they have in fact started studying the cancellation of the concession agreement. “We don’t want to pre-judge anyone here. But we are just trying to make things right,” he said. As to the waiver of collection, Ty said they could not impose this on Manila Water and can only make a suggestion. “I cannot force them. Though, we will do our best to encourage them to do the right thing,” he said. Suspension of payments could be observed until water delivery is back to 24 hours a day, seven days a week. Ty said he already wrote Manila Water asking for a meeting so that they can discuss details of possibly suspending collection from its affected customers. Last Tuesday, Duterte scolded officials of the MWSS and utilities Manila Water and Maynilad for failing to anticipate and prevent the water crisis and accused them of not doing their jobs. Duterte warned the officials to “shape up or ship out” and threatened to fire MWSS officials and to terminate the contracts of the water concessionaires. He demanded that the officials submit a report on the water crisis before April 10. Manila Water has apologized for the water supply issues and has promised to fix the problems immediately. Duterte said he will decide by April 15 whether to fire water regulators and to terminate the contracts of the water concessionaires. Duterte said he would like to know who was really responsible for the water service interruptions and whether there was negligence on the part of regulators. “I will not make a prejudgment. I ask them – everybody concerned to submit a report by April 10 and I will decide before April 15,” the President told reporters after the 122nd anniversary of the Philippine Army in Fort Bonifacio on Thursday. Lawmakers, for their part, pressed for immediate reforms in the water sector. Sen. Sonny Angara said the recent water shortage in Metro Manila and Rizal has exposed the lack of a master plan to ensure proper water management and governance. He said the country struggles with El Niño events every year and water dams drop to critical levels annually. Angara sought amendments to the 43-year-old Water Code of the Philippines, or Presidential Decree No. 1067, which he said did not take into account climate change. Sen. Loren Legarda, who chairs the Senate climate change committee, said authorities must take necessary measures to adapt to climate impacts, such as increasing temperatures, sea level rise, and changes in rainfall pattern, which could further intensify the effects of El Niño and jeopardize the long-term water supply in the country. Speaker Gloria Macapagal Arroyo, on the other hand, wants the House of Representatives to end its inquiry into the water supply crisis. Arroyo she would ask the concerned committees to terminate their investigation. “They’ve already heard what they have to hear for the immediate term. I mean the explanations (of water concessionaires),” she said. She said one immediate solution her chamber proposed was the opening of water supply from Maynilad to Manila Water, which the two concessionaires have done. Arroyo noted Maynilad, Manila Water and the MWSS have been proposing short-term and long-term solutions. “There’s something moving forward and I don’t want to get into those proposals. That’s among them,” Arroyo said.